For the past two weeks New York City has been focused on menswear. Men’s Fashion Week ran last week and after a mere two-day break, the summer 2017 editions of the menswear trade shows were held and concluded when MAN ended its three-day run yesterday afternoon. This is our rundown of all the major events that occurred in Manhattan during Men’s Market. Running concurrently with Capsule in the same hall of the Javits Center, Liberty had an impressive three days from Monday to Wednesday. Sharply curated, the show had seven relatively short aisles and was well laid out and easy to navigate. For the most part there were no huge names on the list of exhibitors and the show offered a nice mix of footwear, apparel and grooming brands. Exhibitors seemed generally happy with traffic and said that key retailers such as Barneys shopped the show. Like the other fairs, no single fashion trend really dominated, which was refreshing since it made for more individuality in the collections. I had never seen this French brand from Biarritz before but was blown away by its casual elegance. Its vests and other items–some of which are in camo this season–combine a bit of suiting with more relaxed pieces. The reincarnation of this brand is a welcome one and it has returned with a fantastic collection that features fun graphics and totally wearable classics. 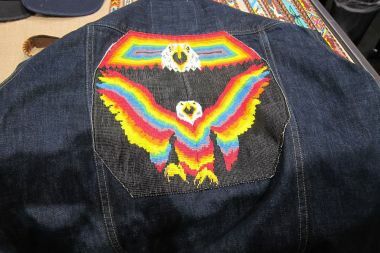 This Brooklyn-based brand is known for its beaded belts and other accessories but it has recently also lent its beadwork to a large patch that is on the back of a denim jacket by local denim designer Loren Cronk. Inspired by Cuba this season the jewelry brand is offering a ring that’s based on a cigar band. Yo quiero. This brand new brand with quite a bit of denim marries two unusual themes: auto racing and the American Prohibition. Based in Uruguay and founded by Sofia Gruss, this footwear brand makes gorgeous dress shoes. A youth-driven line with healthy success Down Under, Nena and Pasadena as it is formally called makes on-trend denims and other apparel that is extremely street-suitable. The long established brand that is best known for its leather moto jackets is offering two great looking embellished denim jackets for spring ’18–the first time it has used the blue material.